You spent the time and money building your app, now you need to start assessing how it's doing. We've broken out 28 of the most useful app metrics into the following categories: user engagement, customer satisfaction, acquisition, and app performance. These metrics are critical to scaling and measuring the success of your app. With each we've added actionable tips to improve on these metrics so you can leave this post with ideas for how to turn an under-performing metric around. Without further ado, here's how you can make app data work for you. Updated 4/10/2019 to include the latest information, statistics, and tool recommendations. This article was originally published on October 18, 2016. This section covers the main metrics you need to measure how engaged your users are with your app. These metrics tell you how many users install and use your app, how often a user interacts with your app along with the likelihood of turning an occasional user into a daily user, and whether your users are abandoning your app for good. As we outlined in 10 ways to increase user engagement, engagement is important because it gives you an idea of how interested and invested users are in your app. You can use your main analytics package (e.g., Google Analytics, Mixpanel, Kissmetrics, etc.) for monitoring and measuring these user engagement metrics unless we call out otherwise. Downloads, or units, represent the number of times your app has been installed and is the first signal of how your app is doing. If your app is seeing few or no downloads, then you need to look for problems further upstream in your marketing funnel (we'll touch on marketing funnels below). By knowing your download numbers and seeing how they trend over time, you know if marketing in particular is going well. Few or no downloads can point to issues with your marketing efforts, the effectiveness of your app store listing, or a lack of app store optimization. If you're worried your app isn't getting enough downloads, consider extending your marketing efforts by creating a landing page or optimizing your app's listing in app stores. Even your app's name and icon can greatly affect how many people download your app. The active users metric is different from the downloads metric in that it measures how many users are actually using your app rather than downloading but not regularly using it. Many analytics tools come with their own criteria for an “active user,” usually revolving around the “session” metric. Session itself can vary depending on the analytics tool. For example, Google Analytics counts a user session as when the user opens and interacts with the app until 30 minutes of inactivity. Therefore, according to Google Analytics, an active user is a user who initiates a session. Active users are often further segmented by the frequency of their sessions into daily active users (DAU) and monthly active users (MAU). A DAU is a user who has at least one session a day, whereas an MAU is a user who has at least one session within a month. Both of these metrics are useful in different ways. DAU, for example, is useful for determining how many of your app's users make up your app's active userbase. This reflects your most important users — the users who stick with your app and use it daily. You can use the ratio of DAU and MAU to determine the “stickiness” of your app. Your stickiness ratio is the chance you have of turning a MAU into a DAU. To boost your stickiness ratio, try leveraging push notifications to bring users back into your app after they've signed up. You can also target frequent app updates to keep your app's features and content fresh, giving users even more of an incentive to return to your app. Average visit time is the average duration of your users' sessions. Screen views per visit tracks how many app screens a user interacts with during a session. Both give a glimpse at how engaged your active users are with your app. In general, the longer time your users spend in your app and the more screens they interact with per visit the more engaged your users. This is where creating an experience rather than focusing just on features will help you. This strategy will require you to create a roadmap to plan out what your future features will look like and account for adjustments based on user feedback. We've previously addressed this topic and other app engagement techniques. The session intervals metric measures how frequently your users return to your app. This is another way to determine how engaged your users are. Basically session intervals measure the time between a user's sessions. It's generally better to have short session intervals, as that means users aren't waiting long periods of time between using your app. The trick to improving your session intervals metric is to try to make your app part of your users' routines. Give them a reason to interact with your app every day. As mentioned earlier, contextual push notifications can help draw users back into your app sooner than they normally would. You can also send frequent offers, discounts, and updates on new features via email to remind users to pop back into the app. Include a time limit on when users can redeem these specials to build more urgency. Retention measures how many users return to your app after their first visit. Since there's more opportunity for your app to be successful when users stick with your app, retention is one of the more important metrics . Unfortunately retention numbers are abysmal for many apps (of course, not ones built by Savvy!). According to a 2017 Localytics study, on average 43% of users return to an app at least once within one month of downloading it. That number drops dramatically in the second month to 34% and slightly again in the third month to 29%. These rates, of course, vary by industry. Here's a visualization by Localytics of what monthly retention numbers look like by industry over three months. Daily retention rates don't fare much better. An Appboy (now Braze) Spring 2016 study found that on average fewer than 25% of users return to an app the day after they download it. That percentage continues to decline every day after the first. Keep in mind that this study looks at daily active users, arguably the most valuable of an app's userbase, and not weekly active users or monthly active users. This AppBoy chart shows how quickly the retention rate drops in the days following the download of the average app. To help diagnose why users aren't returning to your app, measure your retention rate over a daily, weekly, and monthly period. This will help you attribute losses or gains back to specific marketing campaigns, known issues, or other potential causes. In general, the best way to set your app up for success in retention is to focus on designing an engaging user experience rather than a series of features. It's not enough to make sure your app is intuitive and usable, but your app needs to offer what users want and need. The companion metric to retention is churn. It measures the percentage of users who stop using your app. Churn is more significant when its your most best or most active users (e.g., top revenue-generating users) who are leaving rather than new or “lower value” users. Even losing new and occasional users reflects missed opportunities though. Churn varies quite a bit depending on the kind of app you have, but Localytics did some number crunching on this topic in 2017. They found that in general, 57% of users churn in the first month with the average churn reaching 71% by the third month. Churn according to Localytics' analysis across the first three months of an app. To address a high churn rate, take a closer look at who is leaving your app. If many are leaving soon after installing your app, you may not have an effective onboarding process. Bugs, crashes, and other performance flaws are another possible culprit here. Or your marketing and outreach channels could be attracting the wrong types of users. If users are dropping off after using your app for some time, your app might not provide enough long-term value or excitement. You can also look into ways to reengage users who show the warning signs of leaving your app before they actually churn. You might be able to convince them to stay with personalized messaging and other incentives. Event tracking monitors how users interact with important features or flows in your app. This is more specific than analyzing which screens your users visit. Instead with event tracking, you're analyzing the actual actions users are taking with your app. Examples of events could include sharing content with a friend, making a purchase, or reaching a certain point in a game. Think carefully about which events make the most sense for your app. The instinct may be to track as much as possible, but all that data can get unwieldy fast. The events you track need to be direct indicators of your app's goals. For example, we helped Pocket Prep set up event tracking for their “Question of the Day” feature. Their tracking tells them how many users attempt the question and how many complete it successfully. This helps them monitor how their Question of the Day, a feature that encourages user retention, is performing. This section covers the main metrics you should use to determine whether your app is meeting user expectations. These metrics tell you which features users prefer (and which features are missed), how likely your users are to recommend your app to others, and whether users are interacting with your app as you intended. Great apps know their audiences. These metrics will determine whether all that user research you conducted at the start of the app creation process was on the mark. Your app's rating is the quickest way for a user to see what other users think of your app. In addition to affecting your app's ranking in app stores, your app rating can encourage or discourage new users from downloading your app. In fact, 79% of users check ratings before downloading an app according to a 2015 Apptentive study. For those who do, the app's existing ratings will play a role in the user's decision to download that app, as shown in this chart of 2016 Apptentive survey data. Apptentive illustrates how users are far less likely to consider downloading an app with a three-, two-, or one-star rating than a four- or five-star rating. To improve your app's rating, try incentivizing five star reviews. Prompt your users to rate your app within the app itself to improve the chances they'll go to that extra effort. Be careful to prompt that rating only after you've shown why your app is valuable or the improvements that have been made. Also, if a user provides your app a good rating via your in-app feedback tool, encourage them to do the same for your app's store rating and send them directly to your app's listing in the app store. You can also try contacting and working with disappointed users to see if you can convince them to change their negative rating to a positive one. While Google Play allows users to directly respond to reviews, Appbot provides a really useful tool where they'll attempt to help you discover who the reviewer is on the App Store. App Store or Google Play reviews are feedback left by users that show up in your app's app store listings. Like your app's rating, these reviews can positively or negatively impact your app store ranking. Unfortunately users who are disappointed with your app are 22% more likely to review your app than users who are satisfied with your app, according to a 2016 Apptentive report. That means that app reviews tend to show more of a negative bias. It's important to keep your reviews as positive as possible because 4 out of 10 app users think of app store reviews as "equally or more trustworthy than personal recommendations," as a 2015 Apptentive survey indicates. To set your app up for success in terms of reviews, attempt to make leaving reviews as painless as possible. This could be as simple as reminding users within the app to leave a positive review and including a link directly back to your app store listing. Take it a step further by personalizing your prompts for positive reviews. You can also use a review monitoring tool to keep track of your app reviews. For example, Appbot sends Savvy Apps updates whenever one of our customers' apps receives a review. We then use that information to determine any similar trends across these reviews. If we see something negative, especially across multiple reviews, it helps us investigate potential bugs and/or deeper issues within the app. Appbot updates you via email to keep you informed of new reviews and changes to your average app rating. Touch heatmaps track the areas on a screen that users interact with the most. User recordings, on the other hand, monitor the actual user as he or she interacts with the app. Heatmaps are useful for seeing which features they spend more time on and which features they miss. Recordings, on the other hand, can be important indicators for how an app makes a user feel and how enjoyable an app is to use. What did you see and hear? Look at the heatmap and recording observations together to try to determine why particular things happened and develop theories about the causes of any friction, frustration, and problems. Watch user expressions as they test the app to get a sense of how the users feel while interacting with the app. Examine how long particular tasks take. The time spent on a task can indicate if something is particularly difficult or confusing for users. It can also show if something is fun, engaging, and easy. In-app feedback is feedback provided by users from within the app itself whether through surveys, contact forms, or shake-to-send feedback prompts. The users who provide your in-app feedback are already actively using your app, so their feedback tends to be more valuable than those who have barely gotten started. Some in-app feedback tools will send additional diagnostic information along with the user's feedback, providing important context for understanding and identifying any issues. Most importantly, in-app feedback doesn't require your users to leave the app to send feedback, encouraging users to continue their session within the app. It’s important to automate what information you do obtain from the user. Pick in-app feedback tools that provide device type/model, OS versioning, and other diagnostic information. Be sure to try to reproduce the issue before sending it to the development team. Provide additional contact options and information to the user either by directing them to a FAQ or allowing them to send you an email. Keep messaging short; one question per survey overlay, for example. This will encourage users to respond rather than get overwhelmed and close the prompt. Support response times reflect how long it takes to respond to customer feedback and requests. When examining this data, be sure to also take into account the quality of the customer support responses and how satisfied users are with them. Tools like HelpScout have built-in productivity reports to measure the amount of time it takes to get back to your users. By measuring and reviewing this data you can see response time trends and whether you're responding in a timely manner. This HelpScout diagram shows a breakdown of response times with a separate chart that specifically measures first response times. If you're struggling with getting back to users in a reasonable time, you need to identify why. Do you have enough people dedicated to support? You may need to consider adding to your team. Delayed response times can also hint at a lack of urgency. Make sure you designate a response time goal you expect your support team to achieve. You may also notice that you're being inundated by similar user requests. If so, this could mean there's a significant issue with your app that needs to be prioritized. Your app's net promoter score is the likelihood of a user to refer your app to someone else such as a friend, family member, or acquaintance. It uses a ranking on a 1-10 scale. HelpScout defines the scale benchmarks with 9-10 as promoters, that is users who are most likely to recommend your app, 7-8 as passives, and everyone else as detractors. Only promoters and detractors decide your net promoter score. Passives are not included in the equation. Graphic courtesy of HelpScout. You can calculate your net promoter score by subtracting the percent of detractors from the percent of promoters. Aim for a score of 50 or more, and keep in mind that your score can creep as low as -100. Promoters are important because they attract more users to your app and aren't as much of a strain on customer service requests and reviews as detractors. According to Drift, promoters tend to have an average lifetime value that's three- to eight-times higher than detractors as they tend to stick with your app longer, generate more revenue, and are more likely to recommend your app to others. To boost your net promoter score, focus on making real-time customer support a priority and emphasize urgency in your response team. You should also seek out detractors by sending email and in-app messaging to identify where your app is falling short. Remember to keep your prompts to a single question to increase the likelihood of receiving feedback. This section contains the main metrics you need to determine how users are finding your app. These metrics reveal how prominent your app is in app stores, which marketing channels are funneling users to your app, how much it costs to get a new user, and how much revenue you can expect to make off the average user. Acquisition is important because it guides your marketing campaigns and helps you make financial decisions regarding how much money you're willing to spend to attract new users compared to how much a new user is actually worth. Your app store ranking is how visible your app is in app store search results. Since 65% of people download apps they find after searching for something in the App Store according to Apple (expect a similar percentage for Google Play), it's clear that showing up in search results is a big deal for apps. Apple's app search algorithm in particular tends to reward apps with high app rankings by making them more visibile in the App Store. The more visible your app is in app stores, the better chance you have of reaching potential users. To increase the chances of having your app appear in the right search results (or any at all) you need to optimize your app store listing. The easiest way to do this is by meeting app store optimization guidelines like using keywords properly in your app name and app listing. You can also increase your ranking by regularly updating your app (we suggest you update your app 1-4 times a month), and by cultivating positive app ratings and reviews as discussed earlier. For more guidance on app store optimization, check out these resources by Kissmetrics and Moz. Attribution allows you to track the sources that lead users to your app. In simple terms, this shows you where your users are coming from. This metric is especially useful in measuring the success of marketing campaigns based on which marketing effort led to your user download, signup, sale, etc. For example, you can set up a special campaign link to track a user who saw your advertisement, tapped on your link, installed your app, and purchased something within your app. This can help tell you which marketing campaigns and channels are giving you the best return. To improve the return on your marketing campaigns, try using a deep link to direct users from your advertisement or promotion to the exact screen you want them to interact with first, like a personalized onboarding screen. You can also A/B test your marketing messages to find the right fit for your potential users. For example, you could create two different search ad campaigns with two distinct messages to test. You'd then use an analytics tool to monitor which campaign fares better. Tools: App store analytics for basic attribution features. Try Adjust and Branch.io for more advanced attribution. The abandonment metric is the rate of users who abandon your app specifically before signing up or beginning to use it. This metric is important to monitor because it can point to a deficiency in your app's onboarding process or another issue that's standing in the way of signing up your new users. If you're having trouble with users dropping off before signing up, you may want to dive into identifying where exactly your first-time users are leaving the app. For example, if you're seeing that your users are dropping off in the middle of your app's sign-up process, you may want to reach back out to these users via a text message or email with a deep link that directs them to a personalized, unique sign-up experience that will complete the process. We've seen success using deep linking tools like Branch.io to simplify and encourage users to complete their onboarding processes. You should be able to use your standard analytics tools to get an idea of your abandonment rate to some extent. Keep an eye on how your downloads, sessions, and users compare. If your analytics tool of choice measures anonymous users (those who never complete the sign-up process), you can compare those to actual users to get an idea of your abandonment rate. You may also be able to look at the total number of users who hit the login screen and subsequent sign-up screens and compare that with the total number of users who hit the screen that proceeds the sign-up confirmation. Tools: Your main analytics package with some investigation. 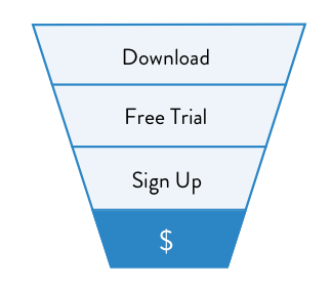 This visualization of a funnel model shows the stages a user might pass through to reach an app's conversion goal. Funnels show the sequence of user flows from acquisition to conversion. You can create your own custom conversion events or take advantage of built-in conversion points in analytics tools. Some common conversion points you may want to include in your own funnel include: referring a friend, subscribing to a service, or purchasing a subscription or in-app feature. By tracking your users through this funnel model, you can see how many steps a user has to take to reach that conversion point. This method also provides insight into how many users are dropping off before converting and at what stage. If you notice many of your users dropping off at a particular funnel stage, you can focus on that stage to identify, isolate, and eliminate any problems standing in the way of conversion. Target users at different stages of the funnel with incentives to encourage them to continue along to the next stage. Intercom.io and similar tools, for example, allow you to set up automated triggers that interact with a user when certain criteria are met. Viralness measures how many new users your average user brings to your app. These users tend to be more likely to be active and stick with your app since they're connected to friends or family who are doing just that. They also tend to cost less to acquire as you don't need to rely on marketing campaigns to attract them to your app, instead you use your existing users and word of mouth. To help encourage your existing users to recommend your apps to their networks, promote word-of-mouth sharing with referral promotions within and outside the app. For example, social, photo-sharing game Pic It! gives users coins for sharing the app with others. These coins allow them to purchase puzzle clues like reveals and lifelines, giving users an edge over their competition while encouraging referrals and continued gameplay. It's also a good idea to reward both parties with the promotion instead of just the user who shares the app as this gives the new user more incentive to try the app. In our experience, apps seem to have more success with viralness when they offer users the option to share content with their networks rather than just including an invite button within the app. By providing content to share, you're giving users a reason to share beyond just their enjoyment of the app, as well as better demonstrating the value of the app to those who have yet to try it. Pair deep linking with A/B testing for your marketing campaigns to create custom messaging and to direct users straight to a personalized screen meant to optimize sign-ups within your app. You can assign a tracking URL to a campaign to see how a particular marketing channel is faring in terms of clicks, installs, impressions, and any custom metrics. If your marketing campaigns don't work as well as you expect, try another channel like text messaging over social media. Tools: Your main analytics package or something like Branch.io. You can also measure how much people are sharing or talking about your app beyond referral campaign tools by using Buzzsumo and built-in analytics for Facebook, Twitter, Instagram, and other social networking channels. Cost per acquisition measures how much you have to spend to get an active, paying user or a subscriber. Acquisition costs can include costs like the money spent on advertisements or PR, technology costs such as hosting and infrastructure, or salaries and contract fees for design, development, customer support, legal help, or comparable assistance. You will need to adjust your cost per acquisition depending on the revenue-generating opportunities within your app. For example, for a paid app you'll want to try to keep your acquisition cost below your app's price tag. For apps that use in-app purchases, start with an industry standard acquisition cost and then adjust as you start seeing how much actual revenue your users are bringing in over how much time. You can get a general idea of what an average acquisition spend per valuable user is by checking out Fiksu's monthly index analyses. Fiksu measures the cost to acquire users who complete “high-value” actions, not users who download but aren't very engaged with the app. This Fiksu chart shows a shifting average cost per purchaser for iOS and Android apps from September 2015 to September 2016. Viralness (mentioned in the previous section) is a low- to no-cost method of attracting new users to your app. These users tend to require much less investment than those who encounter your app through marketing channels. You should encourage viralness as much as possible. Targeted marketing campaigns give you the opportunity to reach users with your chosen criteria and spend only what you want on these high-value users rather than a mass of generic, low-value users. Most marketing channels allow you to set specific criteria such as gender, age, and device location for the types of people you want your marketing messages to reach. In October 2016, Apple introduced new search ads for its App Store. These search ads give developers more control over the visibility of their apps in search results by targeting relevance, campaign pricing, and desired audience metrics. Lifetime value (LTV) is how much total revenue you make from a user before that user stops using your app. This also keeps in mind the cost per acquisition. It can take a while for a user to spend more money on your app than you did acquiring that user. This will help you figure out about how long you need to retain your users to make a profit from them. Lifetime value will also help you predict how much revenue your product will make in the future. The best way to extend the lifetime value of a user is to be attuned to the needs of your userbase. Listening to their feedback and releasing regular app updates to address common issues and requests go a long way to keeping them engaged with your app. Amazing customer support and quick response times can also outweigh short-term issues (see the sections above). As we'll cover in the next section, the performance of your app is also very important. Finally, if you haven't already, consider moving to a subscription model instead of a one-time purchase. This will ensure that you're covering yourself for ongoing costs required to maintain your app. Your revenue target is the goal you set to achieve a certain amount of revenue over time. Use this metric to keep your strategies on the right path. Some techniques to help you meet your revenue target include looking at this metric over a weekly basis to keep track of where you stand in terms of your goal. It's important to make the goal specific. Set a percentage or hard number to meet instead of a soft goal. This will help you stay accountable. Average revenue per user (ARPU) is how much revenue the average user generates for your app. Not only is this usually an important metric for investors, average revenue per user is an indicator of whether you will hit your revenue targets. To accurately track this metric you need to stay familiar with the data to make sure outliers aren't skewing your average. This is especially important if you don't have many users. A single high revenue customer can have a big impact on your average. Tools: You calculate ARPU by dividing your total revenue by number of users. You can get these numbers through your main analytics packages and whatever you use for tracking revenue. The average order value (AOV) metric is the average amount spent by users in your app, while the average order value per paying user (AOV per paying user) is how much you can expect a paying user to spend on average. These are more specifically useful in ecommerce situations. These two metrics can help you measure the value of users who haven't converted into customers or paying users yet. You can also use these metrics to understand how much users are buying on average and know whether you need to implement strategies to convince paying users to purchase more. To improve your AOV and AOV per paying user metrics, try offering additional product or service suggestions at or right before checkout. These last minute promotions can hit a user when he or she is most likely to carry through a transaction. You can also add specials and promotional pricing to encourage users to purchase more per transaction. Tools: To calculate AOV, divide the total revenue by the number of orders. You can get these numbers through your main analytics packages and whatever you use for tracking revenue. This section contains the metrics you need to determine the speed and stability of your app. These metrics look at crashes, latency, load times, network errors, and other factors that may make the app perform poorly in certain circumstances. It's important to take these factors seriously as any one of them could persuade users to abandon your app. Speed is especially significant given users' expectations. We recommend treating speed as its own feature rather than an afterthought. Crashes measures how often your app closes abruptly while a user is using it. To keep your crashes to a minimum, continually test builds during the development process to identify issues right away. Gradually add more testers and eventually have a beta group to catch as many problems as possible before launch. You should also set a threshold that prioritizes the most debilitating and frequent crashes so you can address critical issues first without being overwhelmed by smaller issues. Crashlytics provides important diagnostic information including crash frequency, operating systems, and devices in use during the crash. Tools: Crashlytics, Instabug, HockeyApp, diagnostics provided by the app stores. Check out our review of five popular crash reporting tools. Speed generally measures how fast your app loads and runs. Speed is something you can't accept as a given. Every user expects it. To make sure you meet user expectations, treat speed as a feature. That means you should actually spend time to optimize, refactor, and improve the speed of your app. Don't forget to make sure it stays fast across multiple operating system versions. To monitor how fast your app works, get feedback on the speed from testers over frequent iterations. You can also record yourself using the app to get an exact measurement of how long it takes to load views in the app. There are performance monitoring tools you can use to know instantly when your app slows down or goes down. These tools also offer powerful diagnostic tools to help you pinpoint exactly what's going wrong with your app. App latency is how long it takes your app to request and receive a response from an API. This duration needs to be as brief as possible. App latency is often confused for speed. While speed addresses app load and transition time, latency affects how long it takes to press a button, make a call to the API server, parse the info, and finally display the info. Like speed, you should treat latency as a feature and regularly dedicate time to it. You should also make sure it works across multiple versions of an operating system. This usually also requires that your APIs are following best practices and receive optimizations on the server size. Network errors are service provider and HTTP errors when trying to connect to a network. These can result in app crashes. While you can't prevent all network errors, you can focus on better handling the error and making sure the user is aware of what's going on. If the in-app request is taking longer than normal, you need to cut that off and inform the user. Focus on good caching so the user isn't 100% dependent on using the network system. To test these situations, you can use Xcode and Android to mimic different network connection speeds. Charles Proxy and comparable tools can also monitor network traffic between the device and the Internet. You can also utilize third-party networking libraries like Alamofire on iOS and OKHttp on Android. App load per period is how well your app handles many transactions or events at once. It is really a stress test, where you try to do things in rapid succession to overload the app with too much input. It's important to account for these scenarios as your user may encounter problems if they are impatient and try to tap something multiple times to get it to load. To set your app up for success in terms of this metric, make sure non-UI work such as network requests is done off of the main thread so that it does not slow down the UI of the app. You should also only call expensive, time-consuming functions when needed and in the background if possible. Tools: Standard user testing and QA tools. It will take a decent amount of investment and thought to go into how you're going to set up and monitor these metrics. In order to make the most of your metrics, take the time to look at what you think is going to be important before developing the app. Be sure to work with a developer to make sure everything is set up properly, otherwise the data likely won't make sense. You should also target only the metrics you need to achieve your goals. Monitor too much, and you'll end up spending less time on what matters.